Through your support and letters, you have built a special connection with your child. Now, standing in your Compassion child’s home and meeting the family (and maybe their goats, too), the things you’ve read about in your child’s letters come to life. From now on, when you pray for your child and the family, their faces will be vivid in your mind’s eye. This is the value of a Custom Visit. And there is an even greater value for your Compassion child. That’s a message that can transform a child living in poverty. It can be the inspiration to get through tough times, to stay in school, and to see hope in the future. It can even help a child realize that her Heavenly Father also knows her name… and has gone to even greater lengths to reach her. Even if you don’t have a Compassion child in the country where you’ll be traveling, you can still experience the joy of seeing Compassion’s ministry in action by visiting a Compassion Child Development Centre. 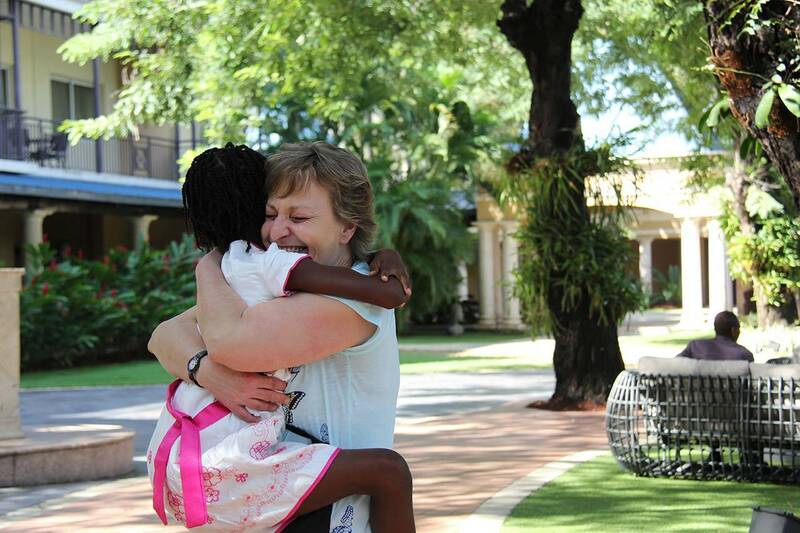 In most cases, you can choose to visit your child’s home and see the Compassion project they attend. It’s a great way to experience daily life in your child’s world. Or, if you prefer, you have the option of asking that your child be brought to the location where you are staying in-country, where you could enjoy a fun day at your hotel’s swimming pool, or maybe do some sight-seeing together. Even a visit to a local mall can be a great adventure for a child who has never had that experience. Our staff in your child’s country know which activities children there enjoy. With your preferences in mind, they will create a suggested itinerary for your approval. Your family and friends, including young children, are welcome to join you on your Custom Visit. There is no age minimum. A trained Compassion Host will be with you throughout your visit. Your host can pick you up on the day of your visit and bring you to your visit location, act as interpreter if needed, and help you connect with your Compassion child. Your host can also answer cultural questions and give you deeper insight into Compassion’s ministry in your child’s country. You can choose to visit as an individual. You can visit your Compassion child on your own or bring friends or family members along as guests on your Custom Individual Visit. Even if you’re traveling solo, your host will be there to help you have a great visit. If you have friends who sponsor children in the same country as your child, and you would like to visit your Compassion children at the same time, you can also create a Group Trip Visit. If you will be traveling to a country where Compassion works, but you don’t have a Compassion child in that country, you can still get an up-close look at the ministry of Compassion by visiting a Compassion Child Development Centre. Our Visits Specialists are a small team of people who love children, love sponsors, and love helping them connect! All of our Visits Specialists have traveled internationally and they understand the kinds of questions you are likely to have when planning your visit. They work closely with the staff in each of our field offices around the world helping coordinate the details of every visit. Each one of our Visits Specialists has helped literally hundreds (and in some cases thousands) of sponsors arrange that one special day that will be remembered for a lifetime.